Cydia is the jailbreak app store -- the place to get all the great, useful, functional programs that for various reasons Apple doesn't allow in the official iTunes App Store, like in-app SMS, themes that change the look of your entire phone, quick toggles for Wi-Fi or Bluetooth settings, and much, much more. But whether you're new to the iPhone or to jailbreak, or have been hacking your gear since day one, you know Cydia can be as much pain as pleasure. You can find the most amazing utilities, themes, tweaks, and apps there - but buying them can sometimes cause way more frustration than fun. Now, I fully realize that by jailbreaking my iPhone 4S I've classified myself as a power user who's chosen to jump through hoops go the extra mile to get some of my apps outside of Apple's official app store. But while waiting for the iPhone 4S jailbreak, and living with a stock iPhone for a week, I was reminded of the sheer difference in user experience between the App Store and Cydia. I went over this already on the first episode of our Apps & Accessories Live podcast, but here's the gist. That's it. Sure, tapping the price tag isn't always intuitive for new users (a big BUY or DOWNLOAD button would be easier). Sure, you had to set up the iTunes account and decide to trust Apple with your credit card information. But once that's done, aside from having to verify you credit code if you use a new device, you're good to go. 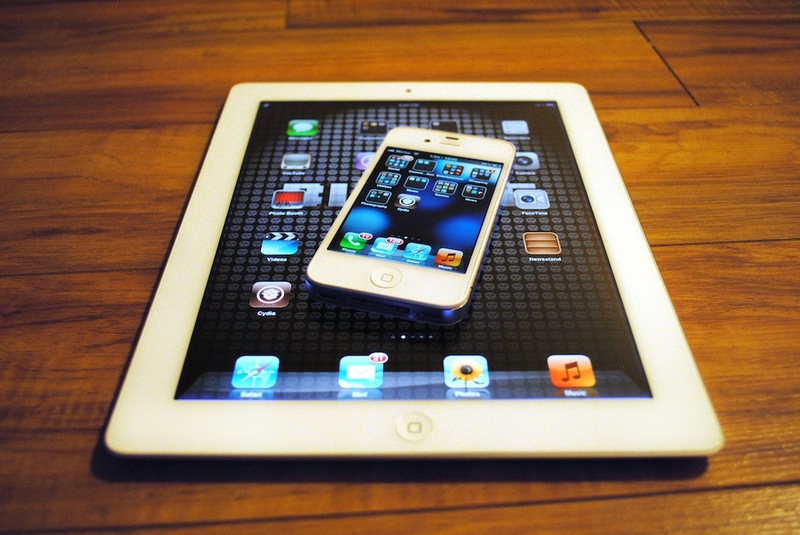 If you have multiple devices, like an iPad and iPod touch, or you upgrade to a new device, you just re-download the app. It couldn't be easier. It makes buying a snap, especially impulse buying. The problems often associated with changing devices, like when you get a new iPhone, and trying to use a previous license. Now you can choose to pre-authorize a certain amount via Amazon, if that's your preferred checkout option, but that really only delays the inevitable. And still that doesn't cover the apps that choose not to be part of the Cydia system. Not only does it absolutely discourage me from impulse buys (good for me, bad for developers), it discourages me from any buys (bad for everyone). Again, I understand that by jailbreaking and buying jailbreak apps, I'm stepping outside the Apple eco-system and the ease of use it provides. I also understand the Herculean task Saurik, the creator of Cydia, tackles every day in making and improving the Cydia app store. Maintaining a user account system isn't easy. Having a checkout system isn't easy. 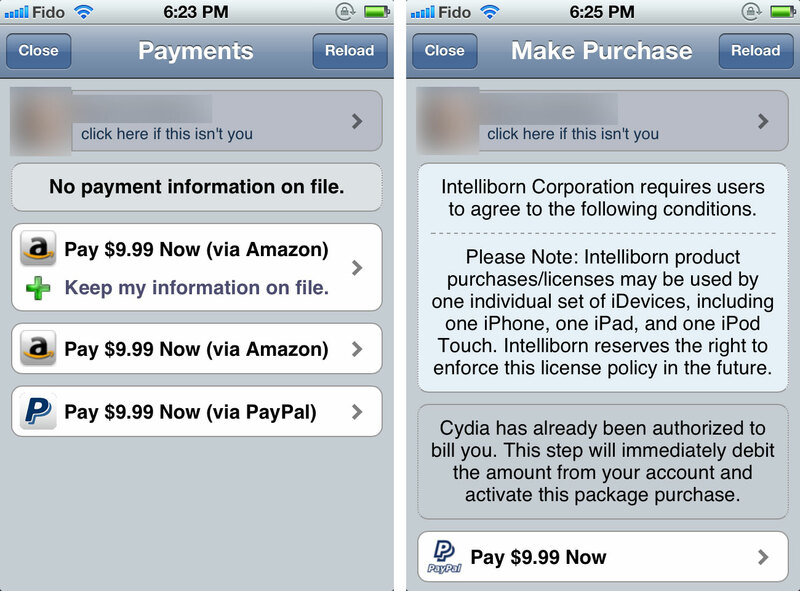 Getting developers the money they deserve and protecting apps from unlicensed use isn't easy. But the current process is still too hard and often too frustrating. Figuring out a way to store the user-account on-device would be a good step. 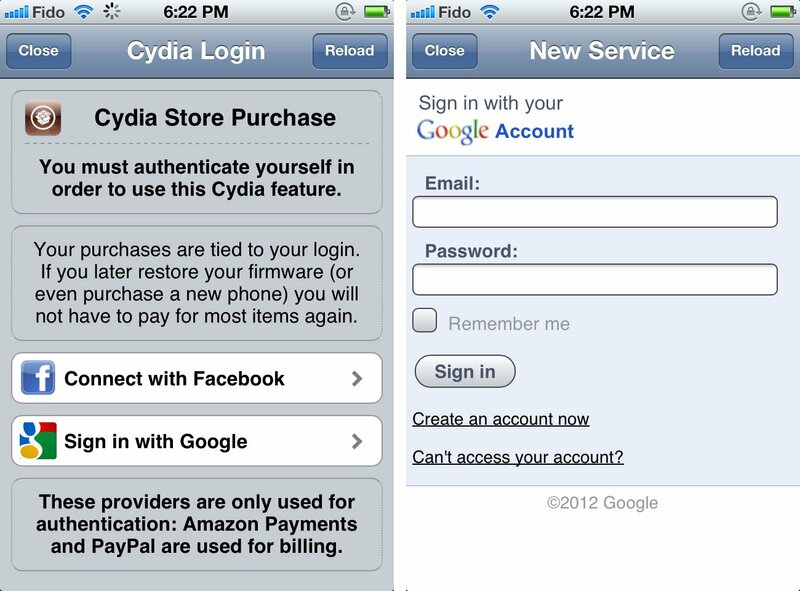 If Google or Facebook force a timeout, investigating a Cydia account system proper would be a great alternative. Storing the associated payment system username would further reduce the friction (not the password, of course). And if a problem occurs, returning the user to the previous screen, not the very beginning of the process, would be a huge improvement. I love my jailbreak. I lasted 6 days with a stock iPhone 4S before I jailbroke. I love the ability to customize my phone -- to make my device work the way I want it to work. I love Cydia and all the great apps it gives jailbreak users access to. I'm offering these criticisms and sharing these experiences because I love it so much, and really hope it gets even better. We've been hearing whispers about improvements coming to Cydia for a while now, so hopefully those will be released and address a lot of what's mentioned above. iOS 5 stole a lot of ideas from jailbreak. It's jailbreak's turn to strike back!